In our last post, we discussed how to create a blog on Google Blogger. I assume, by now we have chosen a topic for the blog, noticeable title, impressive theme and content required to get started with our first blog post. Our aim at Blogging Hacks is to provide quality information on various aspects of blogging. In our first blog post we discussed about creating a blog on Google Blogger. Here is the link to Registering your Blog on Google Blogger. It is very necessary to understand the topics that should be covered in the first blog post. Hence, let's understand the things should be mentioned in your first blog post. The Internet is a vast ocean of knowledge. So if someone comes to your blog, give them a reason to trust and follow you. There is a simple approach to do this. You need to write a couple of things in your first blog post. Give your brief introduction in your first blog post. Let your visitors know who you are, what qualifications, expertise you have, is this your first blog, what kind of content they will see on the blog and what hobbies do you have so they can socially and mentally connect with you. Add your photo to your profile so your visitors don't have to listen from imaginary, invisible person. It is good to develop a friendly relationship with your readers. Let your visitor know the reason for you to be into blogging. Your visitors have a certain expectation from you and it is good to know that they have landed at right place. Give readers know what background you come from, what skillset you have and what is your experience which could benefit them in a blogging endeavour. Visitors would be interested to know what things they will be seeing on your blog. Let them know your vision and what they can expect from you. Now without further delay, let's move on to creating our first blog post. We have seen how a Dashboard screen looks like. Click on Posts menu option from the left panel of your browser screen. It will show three list categories i.e. posts which are in draft phase, published posts and all posts which consist of published and draft post together. For new users, there wouldn't be any posts listed under these categories until we create one. You will see an orange color button to create New Post. Click on it and it will take you to the post-editor page. The post-editor page looks like any text-editor you might have worked upon. With the help of this editor, we will write content in order to create web pages for your blog. The only difference with that to conventional text-editor is beside saving the final document into word or text file we will be creating a new post (web page). Let's put light on the post editor page. Please have a look at below screenshot and let's unravel these sections. 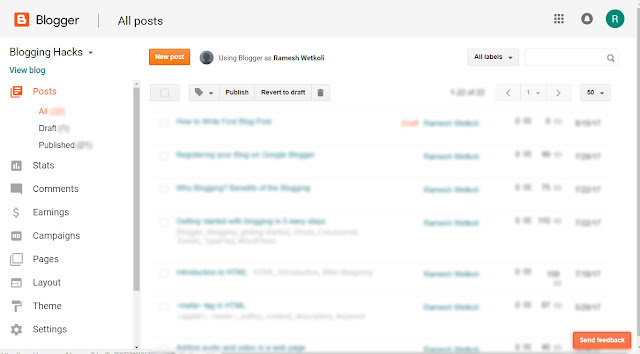 On very top row, you will see textbox for the title of your blog post. This title will be displayed above the post content as well as in the title bar of your browser screen after publishing the article. Post title also plays a very vital role in displaying your web page in search engine results. The better the title more likely to have the visibility in search results. Hence always write a descriptive title in one line or maximum two lines while creating the post rather than ending it within 2-3 words. While writing your blog post you can choose to write a post in HTML or compose mode. The two buttons on the left side, below the title bar i.e. "Compose" and "HTML" let you switch between these two modes. 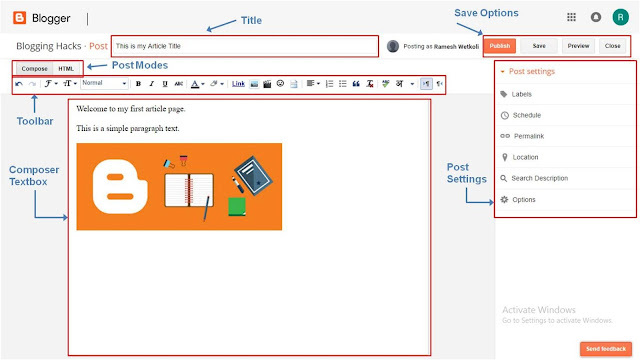 If you choose an HTML mode your post editor window will show you the HTML code of your post and you can continue writing the same if you are familiar with HTML programming. Otherwise, choose 'Compose mode', write the post as you write in any text editor and Blogger will do coding part for you in the back-end. Undo button will take you to one step backward from the current change done in the document. Redo button will take you one step forward if you have already gone into the previous state of the post. The font-family tool will let you change the font for selected text. You can use this tool to set a new font for the text that you are about to write. The new font will be displayed from the current cursor position. The font size tool will let you set the size of the font text. With the help of heading level tool, you can define different levels of headings in a post. Bold, Italics and Underline tool respectively let you set the text in bold, italics and underlined format. Strikethrough tool as the name suggests puts a line through the text that you have selected. The font color tool lets you color the text that you have selected. Background color tool lets you set the colored background for the selected text. You can add a hyperlink to text, image or any other object you have selected with the help of link tool. Image tool will let you add an image/picture into a document. Video tool will let you insert a video into your article. Symbol tool has emoji icons and whole sets of symbols you would like to insert into your post. Let's assume that you have a longer text of paragraphs for the visitor to read. But you would let the blog-visitor decide whether to continue reading by giving him a shorter text and add a link next to it to continue reading. Jump-break tool adds this break-point in a long paragraph from where an initial text is separated and the rest of the text is displayed upon clicking on jump break. Align tool let you aligned elements into four ways. i.e. left, right, center and justified. You can add a number or bulleted list into your post with the help of list tool. A user can add quoted text with a little different style than the surrounding text with the help of this tool. Remove formatting tool removes all sorts of formatting you have applied to the text. Whether the text is bold, colored, bulleted will be undone and will be presented in plain text format. A user can check spellings of the post text with this tool before publishing it live. This symbol could be different in your post editor window depending upon language preferences you have set in the Settings menu. This tool lets you set the language to write text in the regional script. With this tool selected your post text will flow from left to right. Enable this tool if someone wants to write a post in Urdu or Hebrew like languages, where text normally flows from right to left direction. There are few more post setting options on the right side of your post-editor window. Once you have completed writing your blog post, have a look at the right panel and understand these menu options before posting your article live. 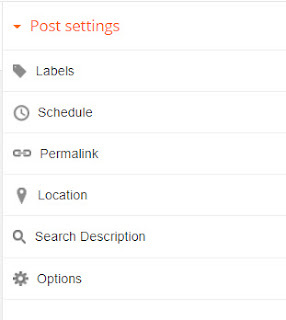 Labels let you categorize your posts. For example, you have written posts on cooking recipes. You may want to categorize them into soup, dessert, Italian, Chinese, Indian, Thai, etc. categories. Your site visitors will have better accessibility when they want to see a post from one particular category. Clicking on a soup label will display all posts labeled with the term soup. Add two to three labels that are closely related to your blog articles. Labels have no influence ranking in search engine results. Hence, do not flood this textbox with too many labels. Note, meta keywords and labels are two different things. Schedule option lets you set future-date for the go-live of your blog post. Once set the date, time and finally clicking upon Publish button that post automatically gets published on the specified date and time without your intervention. Permalink option lets you set the text which will be displayed in the URL. Normally it picks up the title text of your blog post. Though if you want to customize it you can do so by choosing the Custom Permalink radio button under the Permalink menu. Always choose a custom option to see if all text is rendered as title text of the post. A well-written descriptive URL has better readability and helps rank better in search results. Location option lets you add location related to your post. This menu option lets you search Google maps for a geographic place to associate with your post. Search Description is basically a sentence that has post keywords and a short description of your blog post. It is good to have description text as it helps to improve the SEO of your blog post. If this text is not set search engine picks up the few initial lines from your post which is not ideal in every case. And finally, Options let you set the settings for visitor's comments that will be displayed after the post. Whether to allow comments, backlinks (links from the visitors to your post), process HTML and render output in comments, use tag explicitly for taking text over a new line or let enter button do the work, all this can be set under the Options menu. With all the steps done as above, you are ready to take a preview of your blog post before publishing it. Click on the Preview button to take a look how your final post will look in a browser after publishing. Make any final changes if you want to make and publish it live. If you want to save your post in draft and publish it some other time, you can do so by clicking on Save button. We have touched all the points on how to write the first blog post. Please let me know through your comments if you have any queries unanswered. I'll be happy to answer them. In our next article we will have a look at How to Write a Perfect Blog Post.